Bohemian Crystal Has Been Highly Prized For Centuries. Finely Cut With A Radiance That Only Bohemia Crystal Can Give, It Has Won Admirers With Its Superior Good Looks And Brilliant Sheen. Bohemia Cristal Origins Begin As Early As The Middle Ages When Glass Artisans Were Using The Wealth Of Raw Materials In The Mountains To Produce Robust And Durable Glass Products. Bohemian Crystal Is Handmade And Hand Cut In A Process That Can Only Be Performed By Highly Skilled Glass Artists. The Crystal Vase Is Ideal To Be Used As A Decorative Vase Or As A Table Centre Bowl. 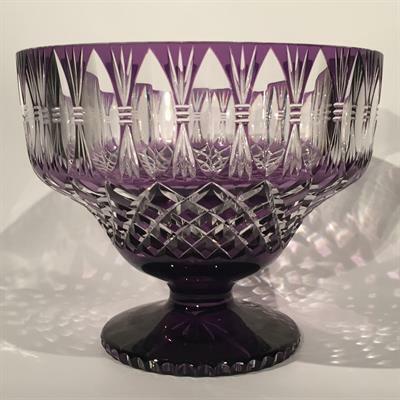 The Vase Is In An Attractive Mauve Colour With Deep Faceted Cut. It Is Devoid Of Any Fleabite Or Chips. It Is An Old Artefacts, Though With Bohemian Crystal It Is Difficult To Quote Its Exact Age.